This project is a joint venture between London-based studios Hudson-Powell / North and us. We developped a tool whose purpose was generating images for Barbican. Based on Vision Factory, the software draws in real time complex tree structures which are real time audio controlled. The Barbican software has been compiled into a plugin for Vision Factory. As an input it takes sound information (either analog audio input or an MP3 file). After the music is launched, a tree shape starts to grow, its behavior being reactive to rhythm and sound frequencies. 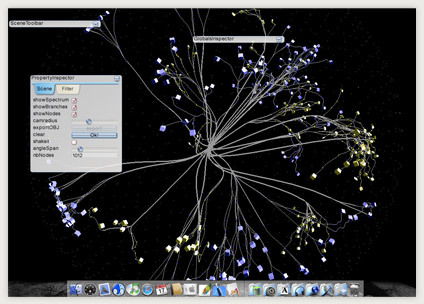 Several parameters on the user interface allow the user to interact with the tree. By playing with cursors and buttons, combined with different styles of music as audio input, an large variety of tree shapes can be elaborated. 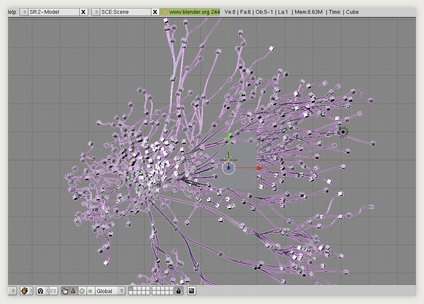 Anytime during the growth animation, a 3D snapshot of the tree can be exported to a file. The generated model is a high resolution mesh saved using the well-kown .OBJ format, which is accepted by most 3D rendering softwares. Inside the 3D software, it becomes possible to work out the lighting, the textures, the camera viewpoint, or to combine different trees to produce the visuals of our choice.